Our natural environment needs us now, and the stakes have never been so stark. I’ve been frustrated this election season at how little attention the environment has gotten. In the first presidential debate, moderator Lester Holt didn’t ask a single question about environmental issues. Just one was asked in the second debate this Sunday. Maybe that’s because only about half of Americans worry “a great deal” about the environment — down from over 70 percent in 1989, according to a Gallup poll. We’re likely prompting one of the biggest extinction events the earth has ever known. Habitat destruction, pollution and climate change have brought as many as 20,000 species to the brink of disappearance, experts estimate. Climate change affects us in hundreds of other ways, too. As air and oceans warm, the extra energy makes weather more volatile. Storms trend bigger, like Katrina, Sandy, and Matthew. Droughts get longer, like in New England this summer. Agriculture falters, shorelines flood, trees die — like the apple tree in front of my apartment building, which last year flowered in the warmest winter ever, stressing it, and this year succumbed to drought. We haven’t won the war on environmental toxins, either, as shown by Flint, Michigan’s recent crisis with lead in drinking water. It’s not just Flint — at least 19 cities nationwide were found to have water systems with deteriorated plumbing at risk of contamination by a 2011 National Resources Defense Council study. Even here in the Valley, lead was recently found above federal action levels in water from four schools in Amherst and Pelham, forcing some taps and bubblers to be shut down. These problems are happening right now, and getting worse minute by minute. And there’s only one choice that gives us any hope of starting to fix them. Can we repair these problems immediately? No. But are we, and the environment, in dire trouble if we wait another four or eight years to get moving, or if we go backwards? Yes indeed. I won’t be the first person to point out the vast gulf between our presidential candidates on environmental issues. I hope I won’t be the last. 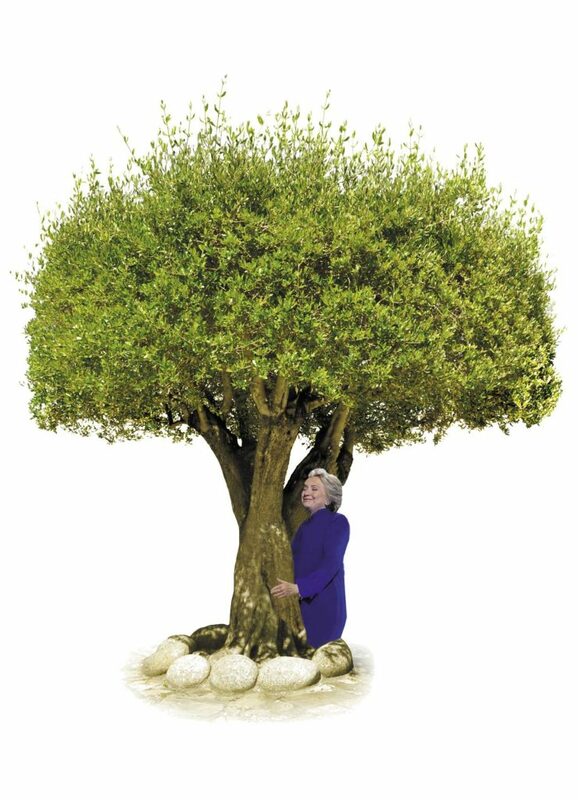 During the first debate, the few times the environment did surface, it was Democrat presidential candidate Hillary Clinton who brought it up. She started by speaking in favor of investment in solar energy and an updated electricity grid to create a green economy and more environmentally-friendly energy jobs, themes she repeated Sunday. Her opponent could only stammer that solar puts people out of work. But as usual, he was wrong — or lying. Last year, the solar industry provided more U.S. jobs than did the oil and gas industry, according to data from the U.S. Bureau of Statistics. Solar employs more people than Google, Twitter, and Facebook combined. Clinton also reminded the audience that Republican presidential candidate Donald Trump claimed global warming is “a hoax” (he did, at minimum, in 2013 and 2014 tweets) that was “created by and for the Chinese” (in a tweet this summer). He tried to deny saying so. After all, even leaked Exxon research has said climate change is real. But even if he believes in climate change, he’s willing to say he doesn’t to score political points. Beyond the debates, a mere glance uncovers the candidates’ wildly divergent commitment to environmental issues. When Flint’s mayor declared a state of emergency in December, Clinton immediately sent staffers to the city. She visited Flint herself in February, alongside creating an environmental justice plan and speaking out about the role of race in exposure to toxins. In contrast, Trump refused to speak about the crisis, saying, “I shouldn’t be commenting on Flint.” He reversed his silence only months later, finally visiting Flint this September. He also wants to eliminate the Environmental Protection Agency. That’d be like ditching the Food and Drug Administration, which prevents disease agents and poisons from entering our food supply. Remember, before the FDA, rat parts and even human fingers often got into Americans’ meat supply due to unsanitary meatpacking practices, as Upton Sinclair eloquently depicted in The Jungle — and many of the poisons the EPA stops from entering air and water have far worse effects. Clinton hasn’t had a perfect record on the environment. She’s garnered criticism for supporting new fossil fuel extraction projects. She’s also accepted campaign and charitable foundation funds from the oil and gas industry. But mixed does not mean bad. Voting against drilling in the Arctic National Wildlife Refuge and opposition to drilling in the Arctic Ocean. Launching an EPA study of air quality at Ground Zero for workers following the September 11 attacks. Voting to continue financing for Superfund, which pays to clean up toxic sites. Forming the Climate and Clean Air Coalition with dozens of other countries to reduce climate pollutants like black carbon and methane. Supporting the Clean Power Plan, which aims for a 32 percent cut in power plant carbon pollution. Working throughout her career for the health and welfare of children and vulnerable communities, which she has connected to a need to protect the environment. Assembling a team of nearly 100 formal and informal advisers on environment, energy and climate change, including scientists, engineers, and former administration officials. And this list is just a start. Meanwhile, her opponent has shown the opposite of this kind of support. He has pooh-poohed the need for environmental protections and for less dirty energy technology. Some have argued for a third party candidate who will, they claim, support a stronger environmental stance. Of course, Libertarian presidential candidate Gary Johnson would cut all government programs including the EPA by 43 percent, supports fracking, and, as late as July of this year, was still proudly proclaiming that he had no plan to combat climate change. And while Green Party presidential candidate Jill Stein talks big on environmental issues, she hasn’t enacted change. She’s held no elected office other than a term and a half as a Lexington town meeting representative, despite five other failed runs for office. I believe we don’t have time to wait. From my perspective, waiting means letting the natural environment deteriorate or be actively attacked for another four years or longer, and ignoring the needs of those who rely on a healthy environment for their own health or livelihood. We need to act now. And that starts by electing the candidate who has promised to act. Do we need more than what Clinton has promised? Sure. Is what she has promised a vital beginning? Absolutely. Right now, the environment needs our vote, and it needs more than our vote. It needs our voice, our enthusiasm, and our courage in supporting a candidate who has spoken up and worked for conservation, environmental justice, and green energy. Clinton will work and negotiate in a positive, constructive way with people who care about the environment. Such people populate her campaign, her policy team, and her constituency. And that’s huge. With this candidate, we can get somewhere. And we have an awful lot of somewhere we have got to get to.